This new accessible bench from Pilot Rock incorporates the ABA and ADA suggested design guidelines and dimensions for accessible seating. The full-length grab bar across the back of the bench facilitates access and transfer to or from the bench. The Model B110C bench is 6 feet long and offers portable/surface mount or embedded frames, galvanized or powder coat frame finishes, and lumber or colorful 100 percent recycled plastic seat planks. Aquatic Access® Inc. builds a variety of lifts for access to swimming pools, spas, therapy tubs, boats and docks for disabled people. Simple to install and maintain, the lifts are powered by the energy of flowing water and are completely safe for the earth. Many models meet all the ADA, ABA and CBC guidelines for public pools. Aquatic Access products are frequently featured on ABC TV's Extreme Makeover® Home Edition. 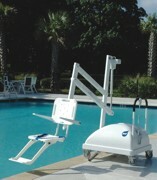 The ADA-compliant PAL is a completely portable aquatic lift, requiring no mounting to the pool deck. It contains over 700 pounds of counterweight to support a lifting capacity of 300 pounds. The PAL is perfect for facilities that need a lift for multiple locations, or would like to store the unit out of the way when not in use. The unit is powered by a rechargeable battery and can be operated by the user via a waterproof hand control. Freedom Concepts custom-builds mobility devices for individuals with disabilities such as cerebral palsy, spina bifida, muscular dystrophy, Angelman syndrome, Rett syndrome and visually impaired. 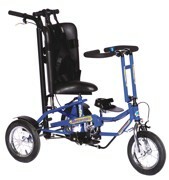 Freedom Concepts custom-designed tricycles, walkers and chairs provide mobility and therapeutic benefits for thousands of special needs individuals throughout Canada and the United States. Transform your pool into an aquatic fitness center in minutes. The ExerSwimTM Portable Swim Current Generator transforms almost any size or type of pool into a private fitness center with a swimming "treadmill." Swim laps, jog or walk in place as you shape up, trim down or train for competitive events. ExerSwimTM is easy to use, easy to install, and easy to transport. People with disabilities make up the largest minority group in America. Don't miss an opportunity to provide safe and easy access to your swimming pools and spas for these important individuals. Aqua Creek manufactures pool and spa access lifts with third-party ADA certification. Their Patriot Portable Pro Pool Lift is the newest addition to their certified ADA-compliant lineup of lifts. EZ Dock® recently introduced its EZ LaunchTM product for kayaks and canoes, and now adds an enhanced feature to provide greater accessibility for people of all abilities—the new EZ Launch Accessible Transfer System. The EZ Launch System is built specifically for paddlers, making it simple and safe to board, launch and recover kayaks and canoes from waterfront properties. Using a roller and guide rail system, EZ Launch allows users of all ability levels to glide on and off, while providing ample foot space on both sides for optimum access and stability.